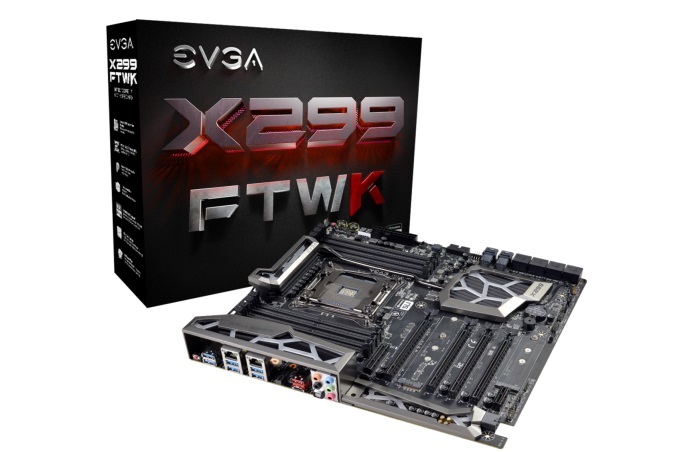 The EVGA X299 FTW K is our first X299 motherboard from EVGA. The FTW K aims to bring users a solid power delivery, three-way multi-GPU capabilities, two M.2 slots, and a unique feature so far on our X299 coverage: two U.2 ports. The X299 FTW K looks to fit into the crowded mid-range segment for X299 motherboards at its price point. We will put it on the test bed and gave it a thorough inspection. EVGA is a bit unique when it comes to their motherboard product stack. 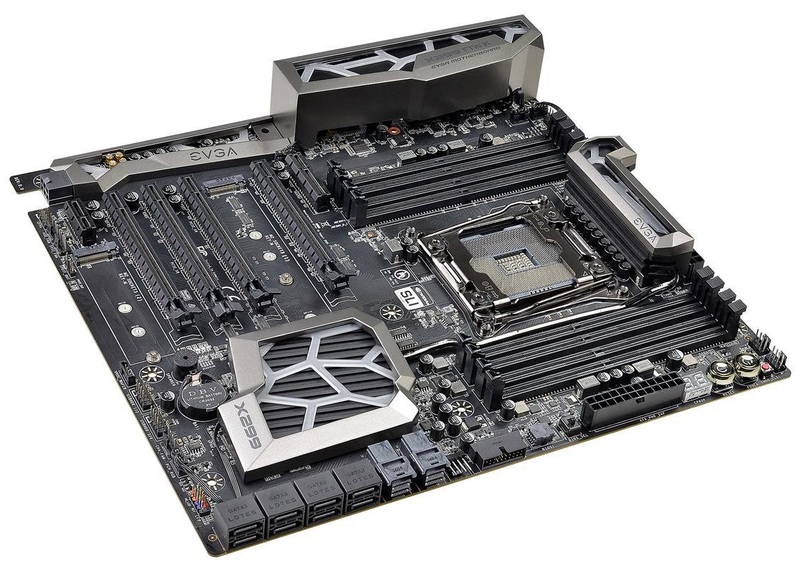 Unlike the four major motherboard companies that have almost a dozen options apiece, EVGA usually has only three boards in the market for a given chipset. This time around, the EVGA boards consist of the X299 Micro (a MicroATX offering), the X299 FTW K (this review), and the X299 Dark (a flagship X299). While a 'gaming' or 'professional' designation is missing, the fundamental requirements for a good X299 board are still the same. The X299 FTW K attempts to hit the mainstream of X299 users, without going above and beyond like the Dark or for small-form-factor builds like the Micro. One of the more unique items to crop up in our X299 coverage comes from the X299 FTW K: here there are the two U.2 ports on the board. Only a select handful of X299 motherboards on the market have one, let alone two. Not that it is a hugely popular item, but if you are looking for the performance of the top M.2 PCIe x4 NVMe based drives without the potential hassle of cooling them, U.2 and standard sized drives may be your answer. Be aware that in order to use both the U.2 ports, a 44-lane CPU (a Core i7-7900X or higher) is required. Regarding storage options on the X299 FTW K, aside from the dual U.2 ports, there are also eight SATA ports and two M.2 slots. One of the M.2 slots is directly connected to the CPU while the other sources its lanes through the chipset. The board supports up to 3-way SLI and 3-way Crossfire using three of its four full-length slots, despite supporting x8/x8/x8/x8 which would allow 4-way with single-slot or thin liquid cooled GPUs. With it being called the 'FTW K', the K in this case stands for Killer, and one of the gigabit Ethernet ports is powered by an E2500 controller. Our performance results for the FTW K were mostly found to be average with it doing very well in power use. From long idle power testing to our load testing, it used less power than all of the previous X299 boards tested so far because the load voltage was a low, due to the CPU dropping to its base clocks to run. This motherboard, with the latest BIOS we used for testing, automatically applies an AVX offset of -300 MHz no matter if the cores are set to Auto or either of the manual overclocking options. Because of this, and no other board we've tested so far behaves this way, we see a lower power use stock settings. Outside of this, the rest of the results have the FTW K an average performer sitting in the middle of the pack in most other tests. For overclocking, we managed to hit 4.5 GHz on our i9-7900X and ran into our temperature limit. The voltage required to reach this clock speed was on par with the other boards. The EVGA X299 FTW K is currently priced at $330 on Newegg US. This places the board, by price, squarely in the crosshairs of other boards like the MSI X299 Gaming Pro Carbon AC at $330, the ASRock X299 Taichi XE at $323, and the Gigabyte X299 AORUS Ultra Gaming Pro at $350. There is a lot of competition around this price range so it will come down to included features and use to pick between them. EVGA's X299 strategy has three motherboards, competing against the other major manufacturers that have 10 or more boards filling out many of the niches of the market. The least expensive board is the X299 Micro which as its name implies, is a MicroATX size motherboard. Next up the stack is the product we are reviewing here in the FTW-K. This board will compete with other mid-range offerings through its feature set and price. Finally, the flagship of the EVGA X299 stack is the X299 Dark which will match up with other board partner's flagship offerings. I see what you are saying. Do understand however, in the vast majority of cases, users will be thermally limited by the CPU before the board regardless. USB type C motherboard headers should be standard equipment by now. I don't know why they would put 2 U.2 connectors on this motherboard but not a single USB type C header. U.2 is crap, while it's good for NVMe 2.5" SSD drives (well, it's the only solution now). but I really hate how bulky it is, and the fact that the drive still need dedicated power pins. At last real support for 2.5" drives with NVME. The M.2 solution is good for laptops. Hi, could you please highlight the point at which an extra long screw is required. Also, list the specification of the required screw. hi, it seems with the listed config for the 44 lane CPU it requires 60 lanes? !